All of our shutters are 100% custom made..
We do full service production. We have representatives in Bakersfield, San Jose, and in all Southers California ready to assist you. 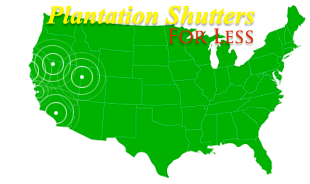 Plantation Shutters for less specializes in professional sales and installation of window treatments such as wood shutters, polycore shutters, and vinyl shutters. We also do shutter repairs and refinishing of existing shutters. We service the areas of Santa Clarita Valley, Antelope Valley, San Fernando Valley, Los Angeles County, Ventura County and Santa Barbara County and as far as San Diego. Within the Santa Clarita Valley and Antelope Valley we service Acton, Agua Dulce, Canyon Country, Castaic, Lancaster, Newhall, Palmdale, Sand Canyon, Santa Clarita, Saugus, Stevenson Ranch, and Valencia. Within the San Fernando Valley we service the cities of Arleta, Burbank, Calabasas, Canoga Park, Chatsworth, Granada Hills, Glendale, Encino, Lake View Terrace, Mission Hills, North Hills, North Hollywood, Northridge, Pacoima, Panorama City, Porter Ranch, Reseda, San Fernando, Sepulveda, Sherman Oaks, Sun Valley, Studio City, Sylmar, Toluca Lake, Valley Village, Winnetka, West Hills and Woodland Hills. Within Los Angeles County we service Bel Air, Beverly Hills, Brentwood, Hermosa Beach, Los Angeles, Malibu, Manhattan Beach, Marina Del Ray, Pacific Palisades, Playa Del Rey, Redondo Beach, Santa Monica, Seal Beach, Venice, Westchester, West Hollywood, West Los Angeles and Westwood. Within Ventura County and Santa Barbara County we service Agoura, Camarillo, Carpinteria, Fillmore, Moorpark, Newbury Park, Oak Park, Ojai, Oxnard, Port Hueneme, Santa Barbara, Santa Paula, Simi Valley, Thousand Oaks, Ventura and Westlake Village.